Dahshur is a relatively isolated place south of Giza. Few tourists visit Dahshur, though the two pyramids here are impressive. The Bent Pyramid is 90 meters tall and is the fourth tallest pyramid in Egypt. 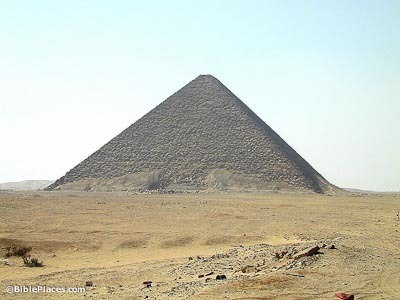 It was built by Senefru, father of Cheops (the builder of the Great Pyramid). The Bent Pyramid is one of the first pyramids built. 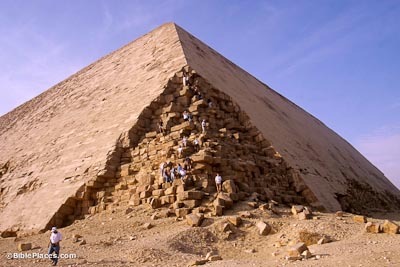 The reason that this pyramid is bent is because the initial angle proved too steep, and the engineers had to change it midway through construction. The Bent Pyramid is the only pyramid with its outer casing almost completely preserved. The pyramids closer to Cairo were robbed out in the Middle Ages by those building the city. The outer casing is a series of very finely cut stones. The overall effect is that the pyramids glisten in the hot Egyptian sun. 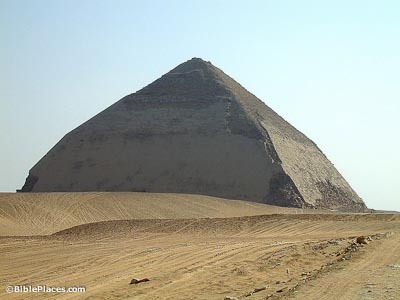 The Red Pyramid was built by Senefru and is 105 meters tall. 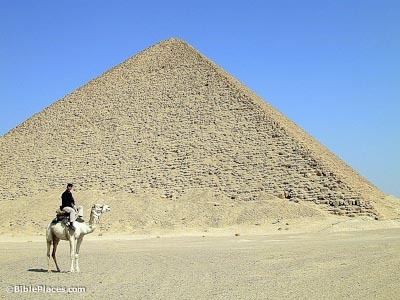 It is the third tallest pyramid in Egypt, after the Cheops and Chefren pyramids in Giza. The Red Pyramid is considered to be the first true pyramid and is made of sandstone. The entrance is made of red stones. Senefru was the founder of the great 4th Dynasty. 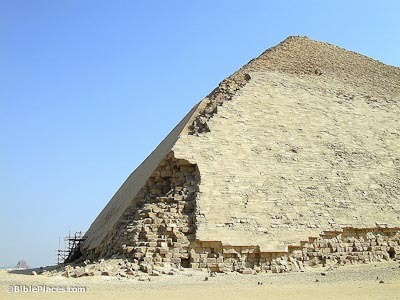 Before the Giza pyramids were constructed, Senefru built three pyramids: these two in Dahshur and another one in Meidum. He is the only pharaoh with three pyramids. The Pyramid Field of Dahshur (Tour Egypt) History of the area including a site map. The Bent Pyramid (Guardian’s Dahshur) Overview of the bent pyramid’s exterior construction and present state, with numerous photos. 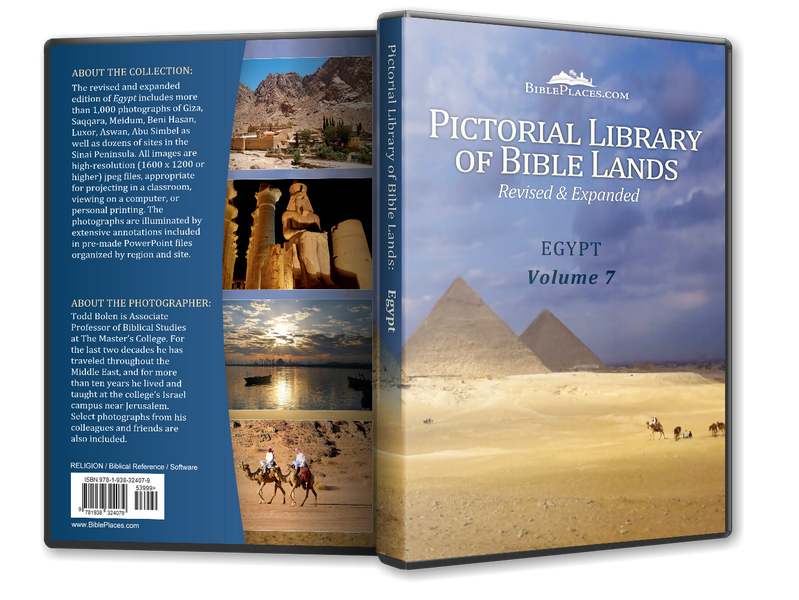 The Bent Pyramid (Guardian’s Dahshur) A rare look inside – excellent photos and diagrams. The Bent Pyramid of Snefru at Dahshur by Alan Winston. Very good explanation of the construction and layout of the pyramid complex, with helpful accompanying diagrams. The Red Pyramid (Guardian’s Dahshur) Tour of the pyramid’s exterior, with photos. Inside the Red Pyramid (Guardian’s Dahshur) Tour of the pyramid’s interior with photos and a diagrams. Almost as good as crawling in there yourself!